For more than 500 years, printing meant arranging metal letters into lines. That finally changed when photography let it happen with TV screens. The Linotype machine cast molten metal into letters in real time, a huge improvement over manual typesetting but still expensive and difficult. Few people would consider Ottmar Mergenthaler a household name, but in the printing business, his work was so appreciated that he was widely hailed as “the second Gutenberg.” His claim to fame? The invention of the linotype machine, which in 1884 finally obsoleted the arduous and much-despised manual typesetting methods that had been the industry standard for centuries. After Gutenberg’s printing press introduced the concept of movable metal type to the Western world around 1440, the process of typesetting changed remarkably little for the next 450 years. 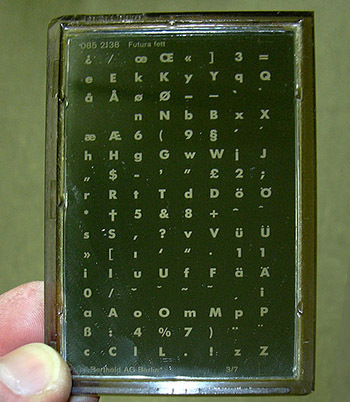 While certain shortcuts were invented – such as the use of composing sticks to set column width, and pre-assembly of certain commonly used words – the fundamental procedure remained manually inserting cast metal characters into forms one letter at a time, one line at a time, backwards, at a rate of one page every several hours. Thanks to the cumbersome nature of manual typesetting, it was nearly impossible to publish a daily newspaper more than eight pages in length from the 15th through the 19th century. 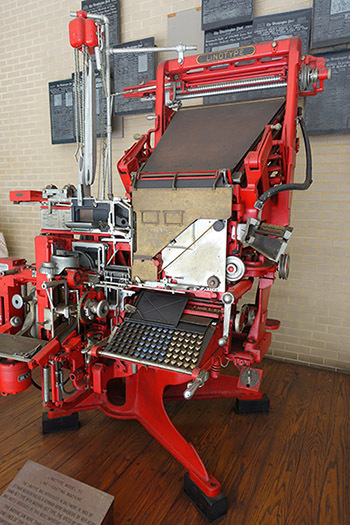 Linotype machines changed all that by casting entire lines of type at once as they were entered from a keyboard, making possible the first truly modern newspapers that resembled the major dailies we see today. They almost immediately took over as the new industry standard, a position they held for most of the next hundred years. But this new “hot metal” typesetting, as it was called, was neither a simple process nor a graceful one. A linotype operator would use a keyboard of up to 90 characters to enter text into the machine, which arranged brass molds (also known as matrices) into a single line of type. The matrices were then injected with molten metal, most commonly a lead-tin-antimony alloy chosen for its relative sturdiness and low melting point of around 475ºF. In less than 10 seconds, the metal was cast into a block containing a solid line of text, and then it was on to the next one. While hot metal typesetting was certainly both ingenious and orders of magnitude faster than the old process, the obvious drawback was that it required dealing with liquified metals, two of which are now known to be poisonous. Proper care of the matrices remained notoriously difficult for years, as most chemical agents that removed the leftover lead-tin-antimony alloy also dissolved the molds. Excessive use of graphite or oil lubricants led to buildup of a gummy substance that jammed the machine’s feeder. And although the cast metal type was melted back down and recycled at the end of the day, it tended to lose some tin to evaporation each time, and so the mix’s metallurgy had to be constantly monitored and adjusted to preserve the print quality. In short: Typesetting by hand was impossibly arduous, but dealing with molten metal on a daily basis was not much fun either. Enter the phototypesetter – the first commercial method of bypassing hot metal typesetting in newsprint, and the bridge between the all-analog printing processes of antiquity and the digital offset printing methods of modern times. That’s where, for a stretch of time in the 1970s and ‘80s, Digital Check (then known by the name Electro-Optical Mechanisms, or EOM) made its first foray into the printing business. Early phototypesetters shined light through plates like this, one character at a time in rapid succession. A phototypesetting machine works by projecting text onto a light-sensitive medium – film in some models, photosensitive paper in others – which is then used to transfer the material for offset printing. Early phototypesetters of the 1950s employed backlit plates with images of the characters to be printed, which would be flashed onto the film one at a time in rapid succession. By the 1960s, it became possible to use CRT monitors to display multiple lines of text, and even images, onto film. But because film was exposed one full frame at a time, the limiting factor with these devices was the size of the CRT screen, which kept the maximum page size down to about 8.5”x11” – perfect for a magazine, but less than a quarter the size of a newspaper broadsheet. Some daily papers tried to use these early phototypesetters and patch multiple pieces together, but typically with poor results that produced visible seams. When photosensitive paper began to be used in place of film, however, it became possible to move the medium without exposing the whole thing at once, so a whole new set of dimensions was opened up. For example, by using a CRT screen an inch and a half tall and 18” wide, and moving the photosensitive paper exactly an inch and a half at a time, it became possible to create lithographic plates 18 inches wide by as long as you wanted – the perfect setup for a newspaper broadsheet. The trick was getting exactly the right inch and a half to display, and moving the paper precisely an inch and a half at a time in order to capture the page with no seams. Information International Inc., one of the first manufacturers of film-based phototypesetting devices, had developed a system of optics for strobing data onto various-sized CRT screens and correcting for the curvature of the monitor. But a precision feed system still had to be developed, and this is where EOM’s expertise in film transports came into play. An image of an old EOM phototypesetter showing the internal mechanisms for pulling the photosensitive paper in precise increments past a narrow screen. How did they attain that level of accuracy in an era before computer controls? It started with the same basic element that ran the company’s earlier projectors and cameras: a 48-amp, low-inertia motor that went from a full stop to 5,000 rpm (in either direction) in less than three milliseconds. Attaching a DC tachometer created a velocity servo that could be used to regulate acceleration. This was the first step toward controlled motion – but only for continuous feeding, such as in a projector. To achieve the necessary precision with the intermittent start-stop action of a typesetter, they needed to create a position servo more accurate than anything they’d attempted before. Through great pains, the EOM engineers developed a digital encoder for position control, etching 3,600 line pairs, alternating between light and dark, into a glass disc 1¾” in diameter and 0.02” thick. Attaching that disc to the motor (“We had to figure out how to mount that thin piece of glass to the motor shaft without breaking it, which turned out to be an incredible problem,” one engineer remembered) enabled a system of LEDs and photosensors to keep count of how many lines had gone past. With 3,600 line pairs, that enabled precision to within one-tenth of a degree of rotation. But that wasn’t enough: With 18-inch rollers, one-tenth of a degree worked out to about one and a half hundredths of an inch – still enough to cause visible seams on a page of newsprint. They still needed to be more precise: to less than the width of a single pixel on the CRT screen that displayed the type. So they developed a way to turn the simple “on/off” reading of light and dark lines into a continuous sine wave by looking at multiple sets of lines at a time. This enabled 500 times greater accuracy, to within three hundred-thousandths of an inch. A set of diode-transistor logic circuits telling which servo to run was locked up in an epoxy-sealed box that gave “the Cube” its moniker. 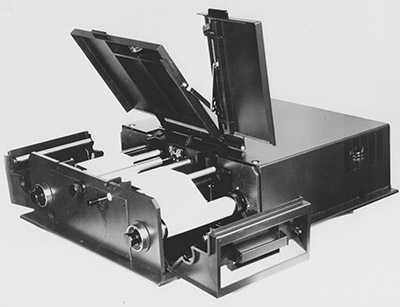 EOM’s first working phototypesetter, the Model 503, was produced exclusively for Rockwell International Corporation, which sold thousands of them to newspapers all over the world in about a five-year stretch. A later model, the 504, was a scaled-down version for magazine use; the subsequent Model 508 was an 8” model designed for even lower price bracket, notable also because EOM’s engineers designed all the internal electronics for the first time. By the mid-1970s, virtually the entire newspaper industry had migrated away from hot metal, but the age of fully digital typesetting was not far off. The 1980s saw the introduction of the first full-blown word processors and a move to completely digital production processes, ending the phototypesetter’s brief reign as the gold standard of the pre-production room. But in a little over a decade, it not only managed to end cumbersome metal typesetting processes, but also brought about a revolution in new fonts and graphics – many descendants of which can still be seen today. And for EOM, it represented the beginning of its own transition from the bleeding edge of the analog era into a hybrid era of digital innovation.